‘Advanced’ searching is about making a highly specific search. So, is your eDiscovery software’s search engine 1) Able to handle complex searches, 2) Easy to use, 3) Fast, 4) Able to save/share searches? Electronic discovery (eDiscovery or e-discovery) beats regular ‘paper’ discovery in many ways. For one, you can deal with digital data like emails and PDFs without having to print them out. eDiscovery also saves you space. Files that would fill multiple boxes (and sometimes rooms full of boxes) now fit in a small computer hard drive. But a key advantage of eDiscovery is how easy it is to search your data. You don’t need to spend hours skimming through hundreds of documents anymore. Your eDiscovery software will find what you need, in seconds. It searches your case the same way Google searches the internet. The trick is to make your search as specific as possible. But what if there are hundreds of ‘John Anderson’ emails? And what if finding those emails is only the first step? For example, what if you want to find all emails John sent to his colleague Sally Nedry, where he discusses severance packages. But not the ones from 2015 (they’re being dealt with by someone else, say). That’s a specific search. And if your eDiscovery software can’t handle it, you’ll be stuck doing it in stages. You’ll search for ‘John Anderson’ and ‘Sally Nedry.’ You’ll then search those emails for ones that also have ‘severance package’ in them. And once you get those results, you’ll have to exclude any that deal with 2015. That’s a lot of work. And, your case will need many more of these ‘advanced’ searches. So, can your eDiscovery software handle an advanced search? What you ideally need is to be able to tell your eDiscovery software the following, in one shot: Find all John’s emails to Sally about severance packages—but not the 2015 packages. And that’s what advanced searching does. 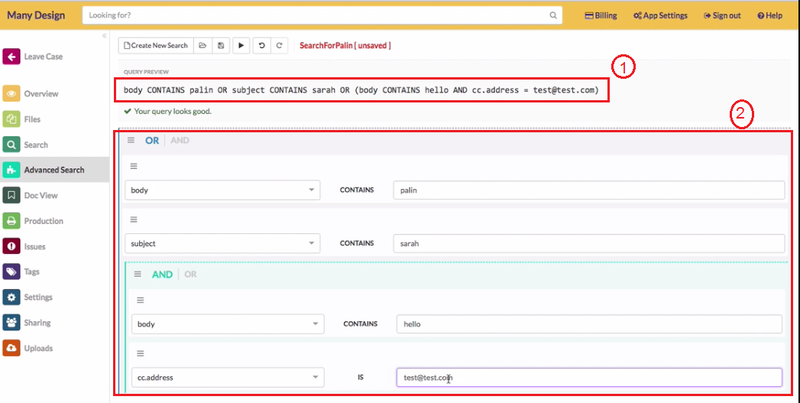 It lets you give a specific (and complex) search instruction. Which saves you a lot of time and energy. Four essential advanced search features your eDiscovery software must have. Where to look for the keywords. E.g., in the body of the email, in the email’s ‘subject’ line, in the email’s metadata, etc. How the keywords are related to each other. E.g., ‘John Anderson’ AND ‘Sally Nedry’ AND ‘severance package’ need to be in the body of the email. But ’2015’ should NOT. Which of these relations are more important than others. E.g., Having ‘John Anderson’ AND ‘Sally Nedry’ in the same email is more important than having ‘Sally Nedry’ AND ‘severance package alone. These equations often get long and very complicated. So, when reviewing eDiscovery apps, check to see how specific (i.e., advanced) their searches can get. An advanced search is driven by a complex equation, but you shouldn’t have to write that equation. The best eDiscovery apps use intuitive visual aids (e.g., drop-down boxes) to help you build your search. And they’ll help you correct mistakes too. Remember, if you feel like you’re back in a math class, then your eDiscovery software isn’t doing its job. The whole point of advanced searches is that they save you time. So, you shouldn’t have to wait for more than a couple of seconds to get your search results. Remember, you’ll be doing hundreds of searches, so a few of seconds saved for each search adds up. Building an advanced search takes time. So, make sure your software lets you save it once you’re done fine-tuning. That way you can use it again, or build on it for another search. Equally important, you need to be able to share your search with colleagues, so that they don’t waste time building it from scratch. Need advanced searching? Try out GoldFynch for free! GoldFynch is eDiscovery software that simplifies advanced searching. And the best thing is your starter case is free! So, test it without having to pay anything. It can handle complex ‘nested’ searches. Its graphical search builder lets you build your search with only simple drop-down menus and text boxes. GoldFynch converts them into an equation your computer can process. Its syntax checker helps you correct mistakes quickly and easily. It’s simple to undo/redo changes. You can save and share searches, via GoldFynch.